Having written about the experience of cycle-touring in Turkey in Part 1, in this section I will be exploring the route we took and the people we met along the way. 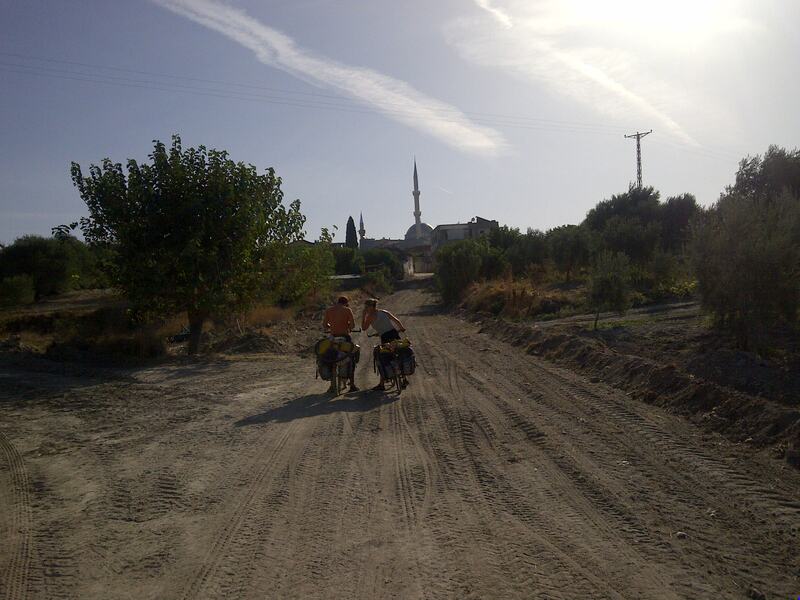 We decided that rather than take the well-trodden coastal road, we would instead go inland, across Turkey. We wanted to get away from the concrete hotels and tourist trappings of the resorts and the attractions. We wanted to see the in-between places that are not glamorous enough to be tourist destinations in their own right but which make up the vast majority of this large and complex country. We had hoped to pick up a detailed map on arrival in Turkey but struggled to find one, so were left with a 1:1,000,000 scale map that did not show every road but gave us enough to go on. We weren’t too worried about getting “lost” as such — we had no time limit and just one far off destination, Antalya, so were able to go “off-piste” as it were, so long as we kept going in a south-eastern direction, choosing our route day-by-day. We arrived in the port town of Dikili, having caught a ferry from Thessaloniki in mainland Greece to the island of Lesbos and the next day a second ferry from there. Our first stop was for lunch of pide, ayran and plenty of Turkish çay. From there we cycled east to the town of Bergama where we had intended on visiting the ruined city of Pergamon, but the volume of other visitors and the TL 20 entrance fee put us off, so we continued east, passing the town of Kınık before heading south, onto secondary roads, into the hills. Passing through the small villages here, a number of drivers indicated that we could not pass this way and we should turn back. One lorry driver got quite worked up about it, insisting that we turn back at once. A mistake we realized we were making in these early days was informing people that we were headed for Antalya. Everyone around there knows that to get to Antalya you aim for Izmir and take the highway from there, so they were at a loss to fathom why we headed in the wrong direction, taking smaller and smaller roads, with poorer surfaces and were concerned for our welfare. We had to go to great pains to tell them that we were carrying tents, food and a map and that we weren’t in any hurry, wishing to explore instead. We had camped in the woods the night before and so stopped to fill our water bottles up at the well in the first village we came to: Kalemköy. Here we had our first experience of real Turkish hospitality. A mother (Tuğçe) saw us from her doorway and waved us over for tea, an offer we couldn’t refuse after an early start that morning. Tea soon turned into a full village breakfast as we sat at her table and she brought first eggs, then tomatoes, olives, cheese, salça and bread. As we ate and drank we chatted in our broken Turkish, sharing stories about our life, where we were going and what we were doing, with her extended families and neighbors who all came around to see the strange Lycra-clad guests. Even the worried lorry driver whom we’d met the previous day turned up as he’d happened to be passing and spotted our bikes. Over tea we were able to explain more about our trip and why we hadn’t taken his warnings and turned back. This was our first taste of Turkish hospitality but by no means our last. We continued our journey passing through the towns of Akhisar, Gölmarmara and Salhili. Just outside Salihli, we were cycling down a country lane, trying to spot a good place to camp for the night, but were unfortunately thwarted by the omnipresence of agricultural land; fields of onions, peppers and vineyards don’t make great camp-spots. This is often the most stressful time of a cycle-tourer’s day, worrying and wondering where he or she will sleep that night. A whistle alerted us to the presence of a farmer, standing in one these fields, who was shouting and waving us over. We went to investigate. He asked what we were doing and we explained as best we could that we were looking for somewhere to camp for the night and did he have some land that might be suitable? He said that there was no need — he had a house not far from there that was empty and that we could use. Thinking this sounded too good to be true, we followed him with some trepidation. We needn’t have worried. The reality was almost too good to be true. He had a lovely little farmhouse, which stood empty when he slept in his town center apartment with his family. He made us tea, let us watch as he milked his cows and then left us the reign of his place and his fridge, telling us he’d be back in the morning for breakfast. A little shell-shocked by this level of generosity we enjoyed a warm shower, a decent meal and a comfy bed. The next day, our host Hamza returned, bringing us fresh simit for breakfast and insisted we stay another day. Rather enjoying a chance to rest our weary legs, it wasn’t hard to refuse. We spent the day tending to minor repairs of our bikes as Hamza tended to his animals before returning to start up the barbecue for lunch. Together we cooked a feast of onion pilav, lentil köfte, tomato salad and barbecued chicken, all washed down with Hamza’s homemade raki. We sat on the rooftop and enjoyed the last of the summer sun. The afternoon was spent visiting neighbors for coffee, and on more maintenance. The next day it was tough to leave the little rural idyll we were settling into and got back on our bikes. After Hamza’s we headed to Pamukkale, where we admired the strange geological phenomenon that creates a landscape startlingly similar to that of a ski resort, but were put off once more by the hordes of tourists trudging their way up to the top. We did, however, splash out and treat ourselves to a night in the Alida Hotel, which allowed us the luxury of watching a film in bed and having a lie-in. From there we headed east along the main road to Çardak, before taking the smaller routes south once more. Lake Salda, near the town of Yeşilova, provided some stunning views and great picnic spots, before we headed up into the mountains once again. Here we really noticed the weather start to change and memories of the hot summer sunshine we had felt just a few days before quickly faded as autumn arrived. The air was much cooler and for the first time during our trip we were cold in our tents at night. The trees all sported gold, orange amber hues and a mist hung in the air. We enjoyed this contrast and the quietness it brought to our last few days headed to Korkuteli, outside which we camped on our last night. The sun came out once more for our final day. We flew downhill for 60 kilometers, arriving in Antalya at lunchtime, surprising even ourselves with our speed. It felt great to arrive at my new home after cycling 2,000 kilometers to get here, although it was accompanied with a twinge of sadness to no longer being on the road, exploring new places and meeting new people. It’s fair to say the most memorable moments of the trip were times when we were invited into the homes of locals, interested by what we were doing there and wanting to ensure we felt looked after despite being so far away from our own families. The kindness of Hamza won’t be forgotten quickly and indeed has taught us something about how to treat travelers that we meet. There were many more as well, with whom our encounters did not last long enough to learn their names, just long enough for them to show us their generosity: the man who stopped his car to get a bunch of grapes out of his boot and hand them to us, the bicycle mechanic who fixed a broken spoke without charge, the shop-keeper who gave us a bag of tomatoes for free, the countless cafe owners who refused to let us pay for our tea. They were small gestures, but they made a big difference in making us feel less like strangers a foreign land.